The Complete Häfele. As its name implies, this in-print and electronic compendium is used every day by Häfele customers in the United States and around the world to find the products they need to start a project, execute their design vision or simply run their business. The latest edition is available now. Leveraging the global reach of the Nagold, Germany headquartered company, the U.S. 2017 The Complete Häfele catalog, or “TCH” as it’s commonly known, is packed with the latest innovations and inspired products to serve the architectural, design, cabinet and millwork markets. 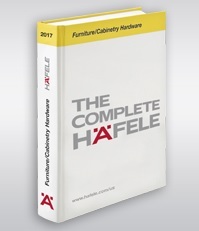 Registered Häfele customers can reserve their printed copy of the 2017 The Complete Häfele catalog through their sales representative or by logging onto www.hafele.com/us. An electronic copy is also available for download or review here.